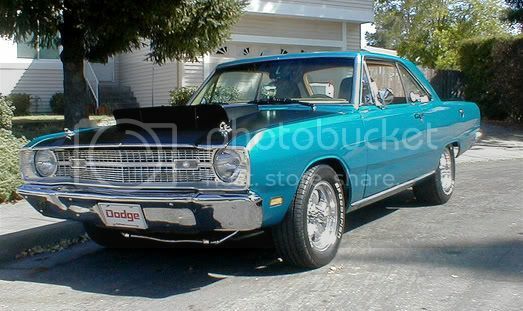 The Other Woman('69 Dart) - Rat Rods Rule / Undead Sleds - Hot Rods, Rat Rods, Beaters & Bikes... since 2007! That is what the wife calls her. I will start by saying that I approached this build differently as it seems it takes years to finish a build. First and foremost my Dart is a driver, I drive it as much as I can during the salt free period we which means, I get her out as early as possible in the spring and put her away as late in the fall as possible. The winter months are set aside to do the updates that I would like to accomplish, for example i have done to date: rear spring relocation, mini tub, custom wheels 10"X15" with a 7 1/2" back space, Moser axles, 3" exhaust to front of rear end, refurbished the factory Hurst shifter, and a few more little things but the goal is to be able to drive her every summer. After my list of update and projects come to an end she will the be blown apart for body and paint. The old girl started out life as a /6 three on the tree no optioned Arkansas car. now she sports a (not so stock) 383 big block, A833 4 speed, 8 3/4" rear with 3.91 gears and a sure grip front disk brakes. 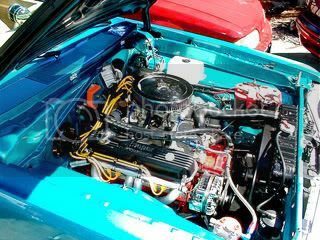 All the parts used to convert were tracked down at swap meets and donor cars, all parts are what you would find on this car if it had been factory ordered right down to the correct big block. The day she was delivered. That's how I approach builds - I like to drive 'em! Looks good. Awesome driver! Congrats & keep us posted! Well color me jealous, I've always liked the old A-bodies. Looking good. I'm with you drive all you can, one benefit to being here in so.cal. is driving all year. Let us know how the winter goes. Proverbs 3:5 - Trust in the lord with all your heart and lean NOT on your own understanding! cool little honey. I like those rides. when I was building the 32 Stude, my wife named her for me........"The Mistress". Thanks everyone for sharing and all the kind words. 2.3 I would have had a hard time giving up that Dart. While aligning the pass front fender I stumbled on a hide a key that who knows how long it's been there. I have a few more pics of her in 2012.